Every summer Canton, Ohio is inundated with thousands of fans expecting to catch a glimpse of history. They fill the hotel rooms of Northeast Ohio for the Pro Football Hall of Fame enshrinement of their favorite players from their favorite teams. Every year there is a rainbow of colors representing the multiple teams being honored. There’s one fan base that consistently changes the hue of that rainbow whenever one of their own is enshrined. That rainbow turns blue whenever the Buffalo Bills are represented. This year as Bills Nation celebrates Andre Reed’s enshrinement, they have again flooded Canton with their spirit, their life, and their love for their team. This year is more evident of their support because they have direct competition for blue supremacy with the enshrinement of the New York Giants Michael Strahan and their fans. 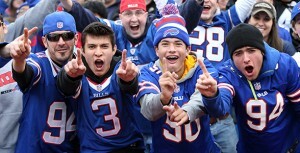 It’s obvious that Giants’ fans outnumber Bills’ fans, but at the Pro Football Hall of Fame, Bills’ fans turn Fawcett Stadium into Ralph Wilson Stadium. At a glance you would believe that the blue in the stadium was a healthy mixture of Buffalo and New York fans but when you take a closer look you notice that there is only a sparse spattering Giants faithful. It’s quite remarkable to watch the faithfulness of a small humble city to their proud franchise. 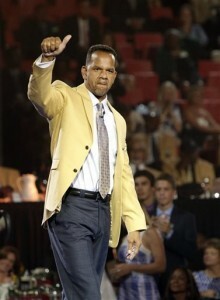 During the inductees’ interviews, although Strahan and Derrick Brooks were the headliners of the class with the biggest media areas, Andre Reed’s booth was flooded with media. At the Gold Jacket dinner, Bills’ fans had the Canton Memorial Civic Center bursting at the seams and the Hall of Fame parade featured Buffalo blue lining the roads to honor their current and new hall of famers. In anticipation of Reed’s speech and the subsequent craziness that would accompany it the order of speeches were changed around so that Reed could be closer to the end. It also helps the induction ceremony keep a full house for every player enshrined; that’s the power of the Bills’ faithful. While Hall of Famer and cancer battler Jim Kelly was being interviewed before Reed’s introduction, the crowd was buzzing and you could see the fans not in their seats scrambling to return. When ESPN’s Chris Berman returned to the stage he led what seemed like the entire stadium in a chant of, “Nobody circles the wagons like the Buffalo Bills!” You could barely hear fellow hall of famer Marv Levy as his introduction played. When Reed finally emerged to unveil his bust with Levy the crowd exploded in a fury. While Reed delivered his speech, the crowd hung on his every word and reacted favorable every time he encouraged them to. The fans were knowledgeable about their heroes and as Reed rolled off all the Bills alumni that affected him in his playing days, they responded accordingly and with reverence and respect for each individual. In unison they all rose and cheered when Reed told Jim Kelly, “I love you bro.” and the crowd gave their most thunderous applause when he defiantly stated, “Oh yeah, and the Bills will stay in Buffalo too!” And as expected once Reed was finished, many of the Bills faithful began to make their way to the exit choosing not to listen to the Giants’ great Strahan. We have not seen a Cleveland Brown inducted to the hall since 2007 and guard Gene Hickerson doesn’t actually evoke inspiration from its fan base. Anthony Munoz was the last Bengal elected but that was in 1998. Pittsburgh’s 2012 class was met with great fan fair but it seems as if Buffalo continues to repeatedly make that four hour long trek in cars and on busses to come to Canton and appreciate their Bills. Fans like those are a dream for NFL owners. 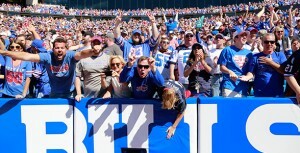 With the passing of long time owner Ralph Wilson leaving doubt about the future of the Bills there is no doubt about the dedication of its fans. “Nobody circles the wagons like…..” Well, you know the rest. 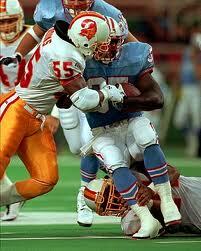 Derrick Brooks may have been a Pensacola Florida product when he decided to attend Florida State University, but when the Tampa Bay Buccaneers drafted him in 1995, he became the Tampa Bay Area’s favorite adopted son. From the moment he put on the number 55 anybody who watched him knew there was something more to him than just his spectacular play. He was quiet and humble off the field and carried himself with a sense of nobility. On the field he was explosive. All of the discussions about his size quickly disappeared as he made play after play. 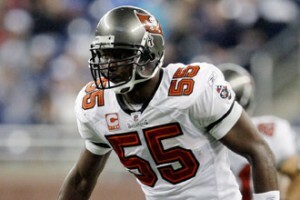 With Brooks as its leader, the Buccaneers’ would eventually boast one of the best defenses of all time. A successful transition from the field has always been predicated on a player’s ability to refocus their competitive spirit and Brooks has been successful in that endeavor. 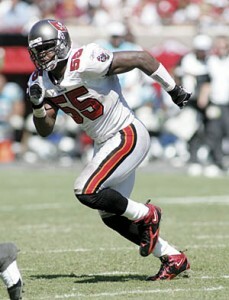 He has been involved in several charities including his own Derrick Brooks Charities, he’s volunteered his time to help whomever he could, he is currently the president of the Tampa Bay Storm Arena Football Team, and in 2005 in congress with the DeBartolo Family Foundation he opened his very own charter school, Brooks-DeBartolo Collegiate High School. Now that he is a member, Brooks has a new mission. He is dedicated to making the Hall of Fame the best it could ever be. Not a small task but a task that he is definitely ready to undertake. You can add it to his already full plate; like everything else in his life, whether it is fatherhood, career, or charity work he will rise to the top. The cream always though.